MC-routes in western Norway. The Fiord district. I´ve had several requests on what parts of western Norway is worth travelling on a motorcycle. 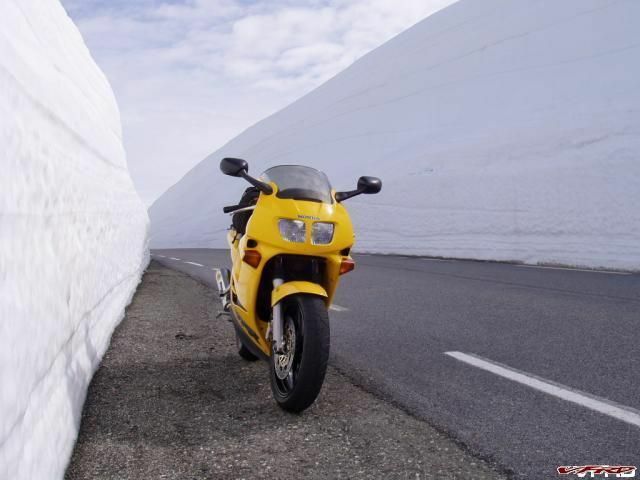 In this blog, I´ll point to some of the more interesting routes for motorcycling in western Norway. Of course there are lots of other routes worth riding, not mentioned here. The videos are from the website RoadMC.com, a virtual clubhouse for me and my biker-friends. Since the site is not maintained anymore, I´ve got permission to publish the footage on YouTube. and the codecs from that time where not as effective as they are today. Click the projektor-icon, and then doubleclick the thumbnail for viewing in YouTube if you want to view in fullscreen. The route from Aurland to Erdal is very scenic and if you want a rerun, you may take the Laerdal tunnel (15.3 mls long) back to the starting point. The Sogn Mountain Road is one of Norway´s more scenic roads, overlooking the peaks of Jotunheimen, the highest mountains in Norway. Having no footage from this route, I found this one on YouTube. The road down from the mountain is famous for its switchbacks including the tunnel at the bottom with its 180o corner, deep inside the rock. Those Norwegian mountain roads are narrow, no center dividing line - I thought for a while it was a one way but oncomming cars proved that wrong. You guys use the whole road, in the USA they ticket you for that but then again no dividing line here so what is the law there about that? You guys have any surprises with a car or bike appearing where you thought there was none? First of all, thanks for putting my blog on the opening page. If the road is so narrow that two vehicles can not pass each other without one has to give way, it is permitted to use the entire road´s width. We have roads with center lines, but as long as they don´t have a double line, one can cross without being fined. The roads with missing center lines usually has little traffic and we prefer to travel outside the tourist season, usually in late May (best weather). In July and most of August the roads are way over-populated by tourists and it's not as fun to drive, but compared to the traffic in the Alps, our roads are virtually empty. Suprises? We have had one situation, coming out of a corner, a car blocking the road, caused injuries to a rider and his bike, but thankfully we´ve been lucky so far, although there is only one of us who have not had any incidents at all. Fine levels in Norway are high, but police seldom checks on these roads. If you get caught, expect fines from $100 to $1200. Owch thats high $1200? cops hand out tickets here like candy, but they are not so bad if you for example dont speed in contruction zones. You can ride rather freely here if you know where the districts are that have good roads but not so many cops then you can have a relatively good day of riding. Seems Nothern Colorado has more cops then the southern half, more tourist too so there is a connection there. There are a few roads like those (with no Dividing line) here too, but only for a stretch of about a half mile or so, roads that narrow can be found in California, Tn, North Carolina, usually in really remote places but none that pretty. I wish I could say I have had no incidents but I have had my share of kissing the pavement, or mud as it were. Usually ice on the road or gravel, I ride kinda slow now so...well slower than I did. 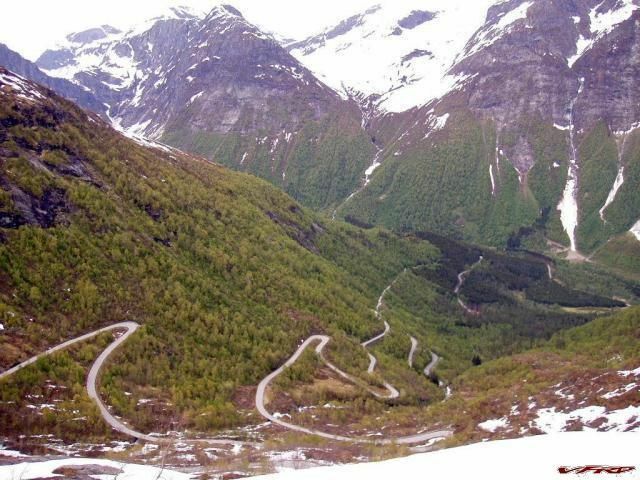 The Norway roads are awesome! 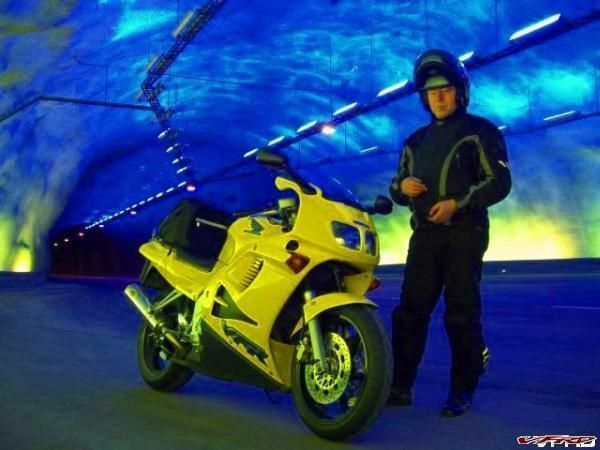 I spent 1½ week on them back in 2002 on my 87 VFR750F 2 up whit my (now) wife. From what i know teh only drawbacks are the weather is changing fast and it rains mutch (to what I´m used to) and food is costy. Still I would like to go back for some mor roads. I know a lot more nice ones to catch now after seeing this! Thro I have ridden some of them back then. Sadly I didnt have a digital camera back then, else I would share the photos and the trip I did back in 02 whit all of you.